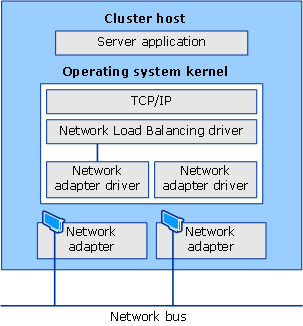 This topic provides an overview of the Network Load Balancing (NLB) feature. By managing two or more servers as a single virtual cluster, NLB enhances the availability and scalability of Internet server applications such as those used on web, FTP, firewall, proxy, virtual private network (VPN), and other mission-critical servers. This topic describes the NLB feature and provides links to additional guidance about creating, configuring, and managing NLB clusters. Manage and configure multiple NLB clusters and the cluster hosts from a single computer by using NLB Manager or the NLB Windows PowerShell cmdlets. The NLB functionality in Windows Server 2012 R2 and Windows Server 2012 is generally the same as in Windows Server 2008 R2. However, some task details are changed. For information about new ways to do tasks, see Common Management Tasks and Navigation in Windows. NLB does not require servers to be multihomed to have multiple virtual IP addresses in the case of virtual clusters. In Server Manager, use the Add Roles and Features Wizard to add the Network Load Balancing feature. Optionally you can install the Network Load Balancing Tools to manage a local or remote NLB cluster. The tools include Network Load Balancing Manager and the NLB Windows PowerShell cmdlets. For more information about installing features, see Install or Uninstall Roles, Role Services, or Features. The following table provides links to additional information about the NLB feature that is available on the web.